This tool generates interactive web bibliographies based on one or more collections in a Zotero repository. Collections can be maintained by groups of people, using Zotero’s web interface or their desktop applications. 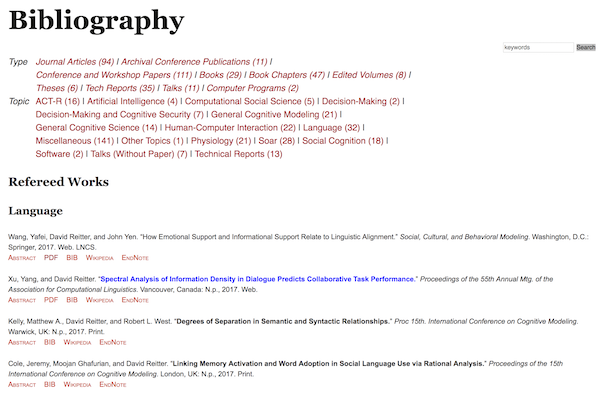 Bibliographies can be ordered by collection, by publication year, or by publication type (e.g., journal articles first), are interactively searchable, can be linked to PDF documents or other URLs, have records for BibTex, EndNote and Wikipedia, and can be exported to HTML or pushed to a Wordpress database. Zot_bib_web does not depend on any third-party web server. The generated bibliographies load quickly because they are stored as static files along with the rest of your website. This makes a good source for webcrawlers, including Google Scholar and CiteSeer. Setup is easy for anyone who runs their own website and knows how to use a command line (shell). The easiest way to use it is to call zot.py with the key of a public Zotero collection. It will make a zotero-bib.html file. Copy this, along with the “site” and “files” (if any) directory to your webserver. View the HTML files in the demo folder for some examples of bibliographies. Their respective settings files and CSS style files are included. No warranty is provided whatsoever. Please e-mail david.reitter@gmail.com a link to the bibliography on your website if you decide to use zot_bib_web. Then view zotero-bib.html in a browser. If that looks good, move on to the next steps for configuration. In a new file called settings.py, add configuration as documented in the file settings_example.py. Go to zotero.org to get your API secret key and your user or library IDs. It’s easy: see the top of settings.example.py for details. If settings.py is set up, you can call zot.py without arguments. Alternatively, you can use give the primary settings in arguments to the program. With Zotero, create a bibliography and note its ID (e.g., from the URL in the Zotero web interface). Example: MGID90AT. This ID is what you need for the “toplevelfilter” variable in settings.py. You can add sub-collections to your bibliography. If you format ordered by collections, giving them an order may be helpful. You can name collections starting with a number: “10 Social Psychology”. To see this, use the provided settings.py as an example. Configuration takes place in a settings file, by default named settings.py. Call ./zot.py –help to see a list of command-line options. Please refer to the documentation for information on the settings file, or read settings_example.py. A few options are discussed in the following. You can order our bibliography by sub-collection, by year, or by publication type (e.g., journal articles first, then conference papers). Even within the higher-level categories you can sort your bibliographic entries as you wish. Use the “sort_criteria” and “show_top_section_headings” settings. You can choose a different formatting convention. Default is APA format. At the top, a search box and a set of shortcuts may be displayed: for example, several years or spans of years, publication types, or subcollections that indicate topic areas. A visitor may click on these to quickly filter the bibliography. Configure the shortcuts shown at the top using the show_shortcuts variable. ‘collection’, ‘type’, ‘year’, ‘venue’, ‘venue_short’, and ‘tags’ are supported values, in addition to more fine-grained lists of values you can create using the shortcut() function. You can give the list of values or ranges (for years), their order, and some filtering to only show the most common ones. See settings.example.py for a detailed example. There are several more options. Again, see settings_example.py. Upload the site folder or its contents to a public place on your web server. By default, /site/… is the assumed URL. run zot.py once/on demand, or install as cron job or service on a server Do not run it more than once a day. Configure it directly in zot.py, or in a separate file settings.py to make upgrading simple. include the resulting file zotero-bib.html (or as configured) in your website as you see fit. You may also include individual collection files, which are also generated. You can configure zot.py to generate a complete HTML document, or just a portion of it. Zot_bib_web generates HTML5 content. Style your bibliography using CSS. An example style file is included (see site/ directory). This package can push directly to a Wordpress site. A separate program “push.py” is included to do this. Set up zot.py to generate a bibliography you like. Call zot.py –full to generate a complete zotero-bib.html file for debugging purposes. Configure settings.py to not generate the full HTML code. Install the wpautop-control plugin (or a similar plugin) to make sure that WP will not insert paragraph breaks at various places in the bibliography. With this plugin, you will need to add a “custom field” to the page created in the next step (Choose “Screen Options” at the top of the page view, enable custom fields. Then find custom fields at the very bottom of the page and add a “wpautop” field with value “no”. Copy the style sheet contents (in site/) to your Wordpress theme (select “editor”, or “Additional CSS”). Configure settings.py so that jquery and other files are available on the web server. Typically, this would be jquery_path = “../wp-includes/js/jquery/jquery.js” clipboard.js and clippy.svg: You may refer to a public URL or serve the files yourself. Configure push.py (at the top). You will need to know a few simple details about your WP installation. Run push.py regularly or on demand. It will call zot.py automatically and then update the page in WP. Add a fast, interactive Zotero bibiography to your website. --settings, -s load settings from FILE. See settings_example.py. The default name for a settings file is settings.py , but any settings file may be loaded using the –settings arguments. See settings_example.py for an example explanations. Include collection from a user library in Zotero. See group_collection(). Include collection from a group library in Zotero. Use group_collection() for a group library, user_collection() for a (private) user library. ID specifies the group or user ID. api_key (str) – The secret key provided by Zotero. If you want to retrieve non-public data from Zotero, you’ll need a Zotero account (or group) at zotero.org. Log into your account, access the Settings page on the Zotero site and create an private API key (under “Settings -> Feeds/API”). For the key, check “Allow library access”. This key is used in the api_key setting. collection (str) – ID of the top-level collection to be included. All sub-collections under this collection will be imported. If not given (None), all available collections will be included. top_level (str) – If true, then the collection given be included as a level. Otherwise (default, False), sub-collections and items will be included directly. The ID of the top-level collection called website is to be included as collection argument. To find this ID: When you click on it on the Zotero website, your browser will show you an alphanumeric key in the URL, e.g., items/collectionKey/FCQM2AY6. The portion ‘FCQM2AY6’ is what you would use in ‘collection’ for the user_collection() or group_collection() directives. Individual sub-collections may be excluded using exclude_collection(). Sub-collections may be renamed or merged using rename_collection(). To cause zot_bib_web to format a sub-collection in special ways, you may add further statements, such as featured_collection(), hidden_collection(), misc_collection(), short_collection(). Remove sub-collection collection . If top_level_only is True, only exclude this collection and items directly under it, but not its sub-collections. Rename collection collection to newName . This may be used to merge collections by giving them the same name. Short mode collection . This sub-collection will be shown using titles, journal and years only, which can then be expanded. Journal or conference titles can be kept short. Specify the “journal abbr or “conference title” fields, or a short “note” if necessary. You may want to copy bibliographic items from other parts of the bibliography into this sub-collection. You may also use a ‘*’ before the name of the collection in the library. Feature collection . Extract this sub-collection and show at the beginning of the bibliography, regardless of whether the rest of the bibliography is sorted by, e.g., year, and ignores the collections otherwise. In the collection shown below, it prevents “in review” articles to show up as regular journal articles (which might give the impression you’re taking credit for not-yet-reviewed/published material!) You may also use a ‘!’ before the name of the collection in the library. Hide sub-collection collection . We still add a shortcut at the top to unhide its contents if they are available elsewhere. You may also use a ‘-‘ before the name of the collection in the library. Show only new items in collection . Show items in this collection, but exclude those items that are already included in another regular collection. A regular collection is one that is not hidden, not short, and not featured. This is useful to add a “Miscellaneous” category at the end for additional items without duplicating anything. You may also use a ‘&’ before the name of the collection in the library. After all items are loaded, filter them using a function. The function given in filter takes one argument, ITEM, and returns True for each item to exclude. ITEM is of type ZotItem. List of strings giving a hierarchy of subsections and ordering within them. Possible values include ‘collection’, ‘year’, ‘type’. Prepend an item with ‘-‘, e.g., ‘-year’ to sort in descending order. Number of first sort_criteria to show as section headings E.g., if 1, the first element from sort_criteria will be shown as section heading, and the rest without section headings (but ordered). If True, enumerate bibliographic items within a category as a list. List of shortcuts. Permissible values include the strings 'collection', 'year', 'type', 'venue', and 'venue_short', or objects made with the function shortcut(). Make a shortcut to the show_shortcuts list. crit (str) – The criterion as a string, selected by the shortcut. Permissible values include ‘collection’, ‘year’, ‘type’, ‘venue’, and ‘venue_short’. values (list) – Optional list of values to be show for the criterion. Each element may be string, or an int (if appropriate, for years). For numbers, strings may specify a range, e.g., “2004-2009” (to select the range of years), or “-2004” or “2010-” to select years before or after the given year, respectively. topN (int) – If given, only show the TOPN values with the most bibliographic entries. sortDir (str) – Direction of sorting. If given, ‘asc’ or ‘desc’, or None (to turn off sorting). sortBy (str) – May be given as ‘count’, which indicates sorting by the number of bibliographic entries covered by each value, or ‘name’, to sort by name. The canonical order is default. If True, prevent user from selecting/copying text that shouldn’t be copied. The resulting HTML document will be in this file. If True, a standalone HTML file is written (default). URL to the style file on the web server. If True, show a button that copies text to clipboard. URL to Clipboard.min.js on the server. URL to clippy.svg on the server. Content filter for viewable or downloadable bibliographic content. Dict mapping strings to functions. Currently, only the function fix_bibtex_reference is supported, which changes bibtex reference symbols to the format nameYEARfirstword, e.g. smith2000towards. Language code used for sortkeyname_order and link_translations Define labels for article types and their ordering Dict, keys are language codes (indicating target language), values are dicts mapping fields to lists. Fields indicate bib item fiels such as ‘type’ or ‘date’. In the Zotero database, these may be in libraryCatalog or itemType. Lists are lists ordered by sort order. Each list element is a tuple of the form (value, label), where value indicates a value appropriate for the field, and the label is what is shown for that value in section headings and shortcuts. Internationalization of link buttons (see also show_links) Dict, keys are language codes (indicating target language), values are dicts giving translation lexicons. Translation lexicons translate from English (keys) to the target language. © Copyright 2017, David Reitter. Revision 527d34bb.